Charlie Reisinger is the Technology Director at Penn Manor School District. The Penn Manor Technology Team is seeking a Help Desk Coordinator. Could it be you? The Help Desk Coordinator is responsible for building a community of support for innovation and learning with technology. The Help Desk Coordinator oversees district one-to-one technology devices, student help desk apprentices, and student technology support services at Penn Manor High School. This is not an ordinary tech support position. You will direct and mentor an embedded team of student help desk apprentices to support the district one-to-one Linux laptop program. Serious applicants should review our guiding principles and watch a short documentary about our award-winning student help desk and open source programs. Comprehensive knowledge of hardware and software support for mobile and desktop devices and a working knowledge of enterprise information technology is required. Excellent customer service abilities, superior communication skills, and a self-driven work ethic are essential. A degree in a related field or 2 or more years experience with mixed technology platforms is required. This full-time position will support students and staff at Penn Manor High School. Minimum salary $48K/year commensurate with related experience. Read the job description here. To apply, email a PDF cover letter and resume to careers@pennmanor.net. Please include the position title, Help Desk Coordinator, in the subject line. Deadline for full consideration: May 9, 2019. On New Years Day, the New Horizons spacecraft completed a historic close encounter with Ultima Thule, a small minor planet a billion miles beyond the orbit of Pluto. The spacecraft left Earth in January 2006, the same year our current high school seniors started kindergarten! Back then, we could rent a movie from Blockbuster, but we couldn’t check Twitter or play our favorite tunes on Spotify. They didn’t exist yet, or Android or iOS, although we had a fancy IBM AS/400 in the district office. Expanded the 1:1 laptop program to all students in grades 5 and 6, and launched a pilot laptop program in fourth grade. Welcomed new staff: Diana Entrekin, Bria Van Cleve, Stephanie Svolto-Patterson, Brielle Bitts, and Jarrod Claar. Exemplary student technology projects were all around us in 2018. Penn Manor High School student-generated VR tours took center stage as part of the Google Tour Creator product launch. And at the Central PA Open Source Conference, five high school help desk apprentices shared their innovative work with software-defined radio, a ROS powered self-driving robot, and live video streaming with OBS Studio. 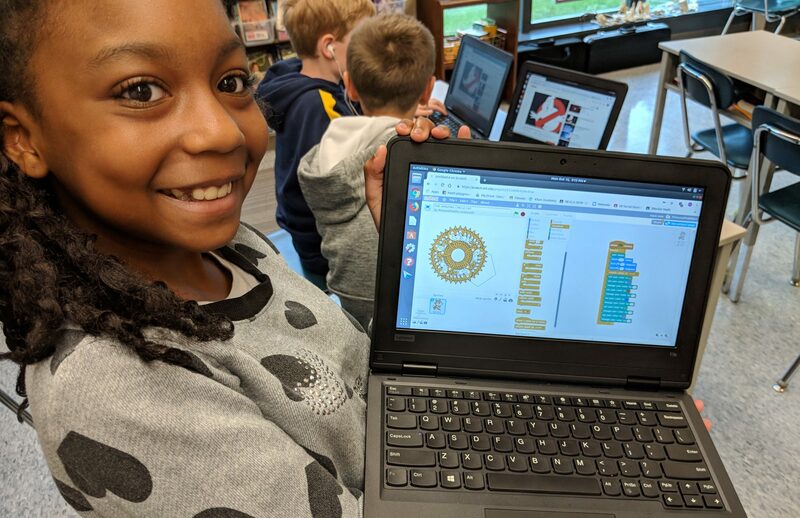 During the past year, more and more elementary students discovered the joy of programming with Scratch. We plan to expand the number of classroom computer science opportunities in the next 12 months. Scratch 3.0, due today, will be a big part of that plan. We can’t wait to see the fantastic code creations our students will unleash! A few other new projects on our horizon include a full one-to-one student laptop implementation in grade 4, a migration of our student device inventory to Snipe-IT, and a planned upgrade of high school teacher laptops. Speaking of the high school, phase one of the anticipated construction and renovation project begins soon. Welcome, 2019! We look forward to another successful start to the new academic year. Here’s a snapshot of the Technology Team’s summer non-vacation! Out from behind the screens: The Technology Team with the sun in their eyes. Grade 5 teachers learning about the Linux laptop program. Look what we found. We’re still searching for the power cord and network port. Caitlin and Nate are very excited about using OBS software in building TV studios. Judy and the giant green screen. Unboxing 1300 laptops for grades 5, 6, and 9. The master software imaging station. From one, many. Student Linux laptops in the software bakery. New firewall ready to go. Total district Internet capacity increased to 7 Gbps in July 2018.